Gandhi World Foundation's main aim is to spread the Gandhian ideologies and philosophies to the younger generation, through Gandhiji's memorabilia exhibitions and by conducting different and unique events. GWF always believe that the younger generation will have more inclination towards Gandhiji's teachings and ideologies and hence the respect, regard over him will grow manifold times. Gandhi World Foundation, on account of commemorating the 65th memorial day of the father of nation, took a giant leap and conducted a massive event on 30th January which was of great success. The event which was one of its kinds saw 1009 children of various schools in and around the city who tonsured their heads, dressed up as Mahatma Gandhi and walked in the roads of Marina beach. The event was aimed at the Guinness, Limca, Asia, Indian and Tamil Nadu book of records of which we have already received the Asia, Indian and Tamil Nadu book of records. Earlier there was a similar event at Gujarat where there were 891 students who were dressed up as Mahatma Gandhi, yet their heads were covered with a cloth and was a false bald. This event broke the record and was a new achievement in the international level. The previous day of the event (29.01.2013), 1025 children were made to assemble at Gummudipoondi for the tonsuring of their heads. The tonsuring event was done with the full consent of parents and they were very happy to send their children for such a noble event. There were around 139 barbers for the same and the event was adjudicated by the Tamil Nadu adjudicator Mr.Babu and India book of records adjudicator Mr.Vivek where we were certified on spot. 4 records were broken there of which two of them were spot certified. The main aim of the event was to reiterate Gandhian ideology of following the practice of walking which made him to stay in pink of health. Gandhi World Foundation helped in giving everybody a take home message "Walking a mile for health and harmony". Involving school children was one of the commendable aspects of this noble event because they can act like message carriers at the youngest level and the impact also reached root deep. All children unanimously wore the Gandhian attires, walked from the Vivekanandar Illam and they carried placards which carried the messages of Gandhiji. The streets of Marina cannot get any better that day with so many Gandhijis who walked all the way till the Gandhi statue. We need to definitely thank all the School Management, teachers and parents of the children for providing their support for us. We in general should be proud of the fact that such an event on Gandhiji happened in the State of Tamil Nadu and it was very difficult for us to break the record which Was set by us on Jan 30th 2013, since convincing the schools Parents of 1025 Children to tonsure the heads of their children was by itself a very very difficult task. We have spent all our Two months for the success of this event, for day and night. We dedicated all our heart and soul for this record. M.L.Rajesh, Founder trustee of Gandhi World Foundation did a lot of hard work for the success of this event , R.Vijayalakshmi, Managing trustee supported by co-coordinating the event successfully and also G.Shyam Sunder who is the trustee also worked in the success of the event .At this time, We need to surely give an appreciation and applause to the volunteers of GWF along with the main organizers , Who did a lot of physical work in this event from maintaining the children and arranging the things which was needed for the event. 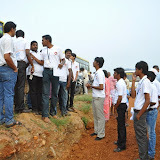 As the young blood, the volunteers were very energetic and fast which made the founder Happy. The event was honored by the presence of Thiru.V.Kalyanam, Personal secretary of Mahatma Gandhi, He came and gave a little speech to children about Mahatma Gandhi and how the children has to be and then he started the rally. R.Gandhi(Senior advocate) attended and honored the event. Other people were Srinivasa Subbiah (Public Notary) Celebrities like Ramesh Kanna( Actor and director) and Babu Ganesh attended the event The event was given a spot certification by Asia Book of records adjudicator Mr.Thomas bain himself, who was present in the event. We want to extend our Gratitude to the Delvin Formulation's Managing Director Mr.Jayaseelan and Mr.yuvaraj for lending their hands and helped us for the success of this event, without them, this event wouldn't be possible for us. They supported us financially, physically and morally. We thank every single soul who helped us for setting this mile stone to spread the ideologies of a noble man of 20th century. His soul would be watching this from the heaven and will be in Peace, thinking that the world will be peaceful and prosperous due to such activities.